Not only do I love this recipe because it's really easy (my two-year-old helped with almost every step) and spiced perfectly, but it's a perfect make-ahead dish. It's great both fresh out of the oven or at room temperature, so you can make it earlier in the day and just let it sit out until you're ready to serve it…totally ideal for Christmas day! The mix of vegetables will satisfy everyone, plus it's gluten-free! Enjoy! Add all vegetables into a large bowl and drizzle with olive oil. Sprinkle with pepper, salt, oregano, thyme and basil and stir so evenly coated. 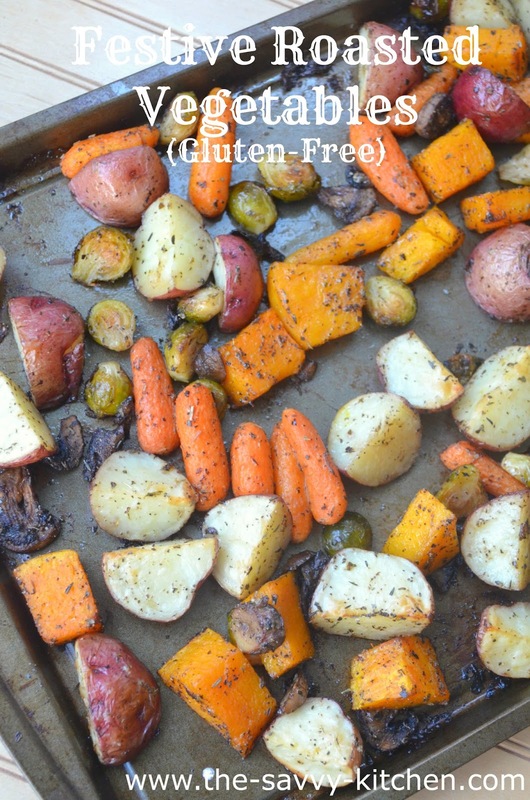 Pour vegetables into an even layer on two baking sheets. Bake for 45-50 minutes, flipping halfway through. Serve hot or at room temperature.